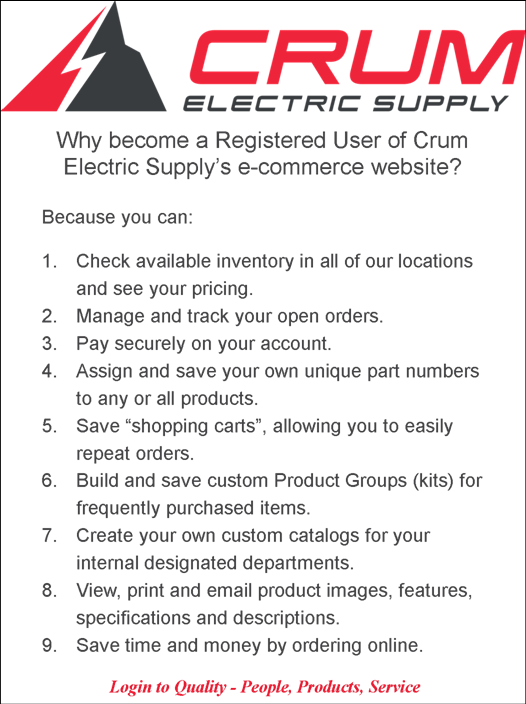 Welcome to Crum Electric Supply's E-Commerce Solution! We are proud to offer this powerful e-commerce solution to our customers - both existing and new - as a valuable resource to help you conduct your business more efficently and profitably. We feel you'll find CRUM.COM as your go to source for everything electrical - plus a whole lot more! Why register? Click on the image below to find out why, by registering your account with Crum Electric Supply, you make available all of the dynamic features of this site.